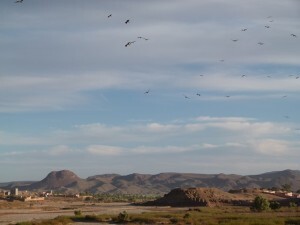 Birds Without Borders: 5 March driving from Ait Benhaddou to Ouarzazate along the pretty Mahel River valley we saw the most incredible sunset sight – thousands of eagles, kites, hawks and other raptors filled the sky over the river valley as they headed northwards towards the High Atlas Mountains. 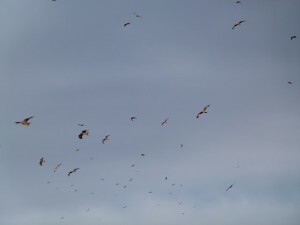 There were strong headwinds as the birds battled their way up the valley toward the High Atlas Mountains. We were in the right place at the right time as we watched the sky for around 40 minutes as wave after wave of raptors came through the valley. Eventually we had to tear ourselves away even though still more birds were making their way into the valley. This miraculous sight was part of Nature’s annual spring migration through Morocco of birds travelling from their African wintering grounds to Europe where they summer. 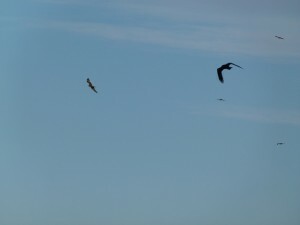 These migratory birds, including eagles and other raptor we saw, were heading northward toward the Tangier area where they will mass with countless hundreds of thousands of other birds on the Mediterranean coast before crossing the Gibraltar Strait. Talk about a Morocco travel highlight – you don’t have to be an avid birdwatcher to appreciate this wonder of nature – it truly was an amazingly beautiful sight. We have added some video footage we took to our Berber Treasures Morocco Tours Facebook page. We only wish you were there with us as the video and photos don’t even come close to doing justice to the beauty and majesty of what we witnessed. Join us in Morocco this autumn for your Morocco travel adventure and the return of the birds southward or plan your Morocco tours itinerary for next spring for the northward migration. Email or call us now to discuss how best to include see this or other wonderful Morocco highlights of nature in your Berber Treasures Morocco Tours itinerary. We have other blogs on the bi-annual bird migration here on our Berber Treasures Morocco Tours website. Contact us for more information.